Rating: 4.9/10. From 18 votes. Summary: The description, specs, photos, pricing and user ratings for the Nighthawk Falcon pistol. The Falcon from the left. 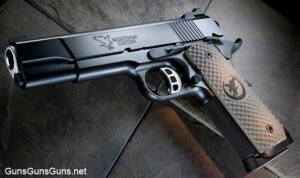 The Nighthawk Falcon is a full-size 1911-style pistol built on a steel frame (an aluminum frame is optional) and chambered in .45 ACP, 10mm or 9mm. Features include a one-piece, fully machined mainspring/magwell combination cut from a 2.5″ block of tool steel. Rather than coming to a sharp point at the grip’s base, the integrated mainspring housing/magwell is rounded for comfort while not sacrificing any grip length. 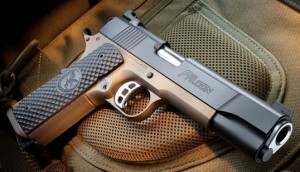 Nighthawk says it assists in reducing print thru clothing while carrying concealed. golf-ball dimple pattern G10 grips in your choice of coyote tan, black or OD green with or without the Nighthawk logo. The Falcon comes standard with a black nitride finish, but you can also get it bead blasted (on stainless steel the guns), with a shadow camo finish (tan, green or urban), or with a cerakote finish (sniper gray, tritium blue or bronze). Note: Nighthawk also offers a commander-size Falcon. The Falcon from the right. This entry was posted in .45 ACP, $3,001-$3,500, 10mm, 1911, 9mm, Full size, Nighthawk Custom, Semiauto on September 7, 2011 by Staff.